My wife and I were both home all day yesterday. But, mostly because we spent a good chunk of the day assembling a birthday gift for our daughter (a bike), neither of us thought to make plans for dinner. As a result, since one daughter had dance class and the other had skating practice, we ended up settling on frozen pizza. We recently visited Costco and actually had some cheese pizzas in our freezer as a result. 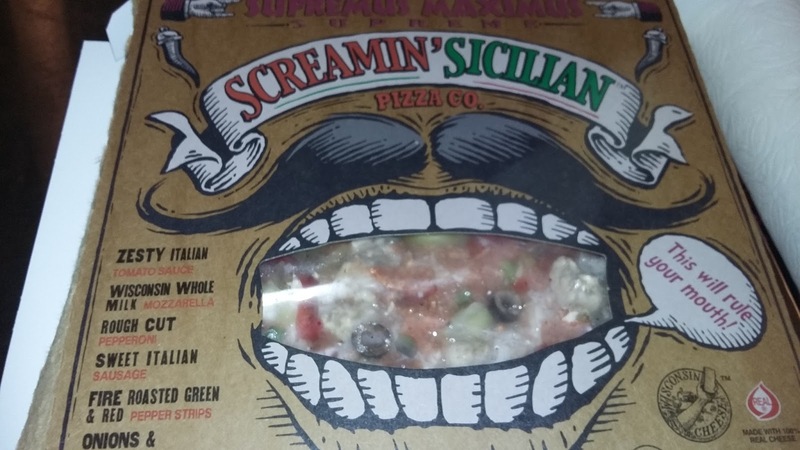 But, while I knew the kids would be happy with that, I wanted a little more and, since I had to stop by the store for milk anyway, I ended up buying one from the Screamin' Sicillian brand. This is a product I considered buying before. However, the pizzas are usually a little too expensive for my budget. The only reason I decided to give it a try last night was they happened to be on sale. Unfortunately, even at the reduced price, I'm not sure it was worth the $5.99 I spent on it. To be fair, I didn't hate this pizza. I thought it had a good flavor to it and it had a decent amount of toppings on it. I also found I liked the fact the crust wasn't paper thin (something I was afraid would be the case because the box doesn't show much of the actual pizza. The problem I had with this pizza is there really wasn't anything special about it. Yes, I liked it. But, there were plenty of other pizzas I could have chosen that would have been just as good and, even with the price reduction, would have been as much as $2 cheaper. In other words, other than the fancy box, there wasn't anything overly memorable about this that would make me want to spend the extra money on it. As a result of this, while I wouldn't rule out purchasing this brand again, it would have to be at a reduced price that is comparable to or better than other pizzas of the same quality ($2.99-$3.99).